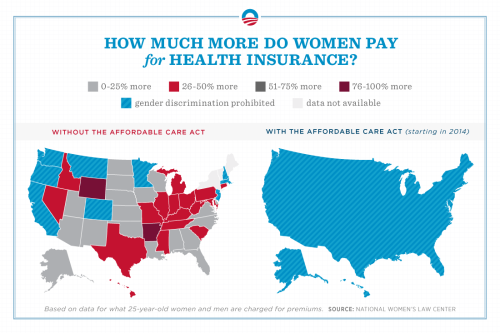 From Barack Obama on tumblr, no less. 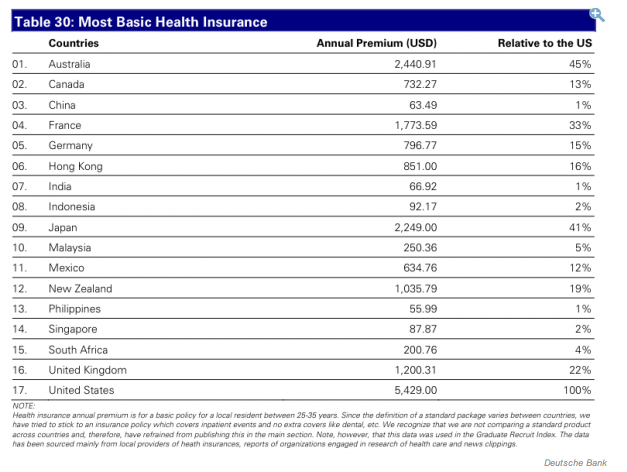 Labels: health care, inequality, u.s.
Ireland in on FATCA? No. This story is making the rounds, but I found it at "lowtax.net": Ireland is in talks with the US over that multilateral FATCA deal, but not really. "It is thought that Ireland wants any agreed approach to FATCA to be based on domestic tax reporting legislation and an automatic exchange of information under existing bilateral tax treaties. As the IFIA has pointed out, Ireland is negotiating the possible adoption of a model global agreement, which would not alter or amend the obligation to identify or report certain information under FATCA, but would outline an alternative pathway for reporting FATCA information. I am beginning to believe Steve Dean when he tells me that getting in on the FATCA deal is not at all about about exchanging more information. Let's just be clear. FATCA is weird and annoying (and even offensive to some) because it is government-to-taxpayer regulation, in which the US is exerting the jurisdiction to regulate the practices of foreign banks. Tax treaty info exchange is government-to-government agreement in which the governments agree to collect information on their own, and then share some of it with each other under pre-arranged deals. Automatic info exchange is a deal in which they turn over info regularly; info by request only if you ask nicely and with sufficient detail. Rand Paul apparently thinks that is also offensive, enough to deny the executive branch the Senate's advice and consent, but I think and hope he's an outlier. When you see the story start out talking about FATCA and end up talking about tax treaties, you are witnessing the struggle over who gets to regulate who in our global economy. Labels: FATCA, globalization, institutions, international law, offshore, sovereignty, tax policy, u.s.
"Paul, a Kentucky Republican, said the protocol is too “sweeping” and would threaten protections under the Fourth Amendment to the U.S. Constitution, which guards against unreasonable search and seizure. Paul said he is exercising his privilege to delay a Senate vote. That's a lot of worry, but Mr. Rand should be assured that unlike in some other countries, information requested from another government by the IRS would be inadmissible as evidence against a U.S. citizen if it was seized by the foreign government in contravention of U.S. law. He could start by reading U.S. v. Wolf, 601 F. Supp 435 (ND Ill. 1984) and U.S. v. Phillips 479 F. Supp. 423 (1979). That's absolutely true and Rand's move is outrageous. "Some explanations for the apparently surprising attitude of developed countries can be found from the informal statements made by certain negotiators. One such representative of an important developed country told his counterpart from a major emerging market economy that they "did not want Unctad to engage in intellectual competition with the IMF"!" The author follows that with "Intriguing, isn't it? Such people are usually all for competition in everything (certainly in labour markets) – except, apparently, ideas." "The Canada Revenue Agency (CRA) encourages you to file your income tax and benefit return and pay on time and online using the CRA's quick, easy, and secure electronic services. You have until midnight on April 30, 2012, to file your 2011 income tax and benefit return and to pay any balance owing." Strasbourg, 27.04.2012 – The Parliamentary Assembly of the Council of Europe (PACE) has demanded a series of steps to end what it calls “massive tax avoidance, evasion and fraud” caused by secrecy jurisdictions, tax havens and offshore financial centres. Adopting a resolution ... the parliamentarians said tackling global distortions due to harmful or predatory tax practices – including bank secrecy, lack of transparency and effective public oversight, regulatory dumping, predatory tax arrangements and abusive accounting techniques within multinational companies – was “a moral duty” because they drain public finances and cause serious harm to the public interest. With this kind of disclosure, that NYT story on Apple would not be so maddeningly imprecise. h/t Richard Murphy, for whom this is "another campaign win"--quite so. "Neither the government nor corporations make tax returns public, and a company’s taxable income often differs from the profits disclosed in annual reports. Companies report their cash outlays for income taxes in their annual Form 10-K, but it is impossible from those numbers to determine precisely how much, in total, corporations pay to governments. In Apple’s last annual disclosure, the company listed its worldwide taxes — which includes cash taxes paid as well as deferred taxes and other charges — at $8.3 billion, an effective tax rate of almost a quarter of profits. "This chart says it all," says Yves. Now I think it really does say it all. 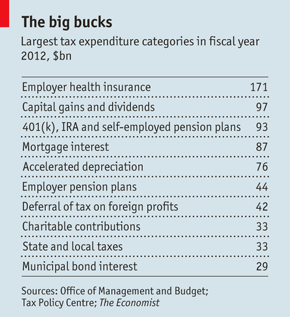 "The federal government is larger than conventional budget measures suggest. Many tax preferences are effectively spending programs. Adding these preferences to federal outlays and receipts makes the government appear about 4 percent of GDP larger. The 1986 tax reform cut these benefits, but they have since rebounded to a larger share of GDP than before. Using this broader measure of government size, many base-broadening reforms viewed as tax increases would be reclassified as spending cuts. Raising marginal tax rates would be recorded as a tax increase and a spending increase because it would boost the value of many tax preferences." Ezra Klein has a couple of posts on it, here and here. I explain tax expenditures to my students only after doing a lengthy bit of work on the nature of income. I'm not at all sure how a non-tax audience understands tax expenditures. Labels: budget, tax culture, tax policy, u.s. ...Penal institutions all over the country became auxiliary arms of capitalist industry and commerce. Two-thirds of all prisoners worked for private enterprise. But this post has turned into a lengthy discussion of the "subsidies and tax incentives" referred to in the article, and why the subsidy described is a case in point of "attractive complexity," to borrow a phrase. Now, I do not disagree with the authors of the article that using prison laborers is inherently state aid and corporate welfare: it seems to me the legalized underpayment of the laborers is by itself sufficiently a subsidy to warrant the concern. But I want to take a closer look at what the authors mean by "tax incentives" for corporations using prison labor. I am not aware of such incentives, so I looked to be illuminated by clicking on the link the authors have provided under the word "subsidies". The link takes us to UNICOR where you can read about the work opportunity tax credit (WOTC), which may be available to "[l]ow income ex-offenders (Economically disadvantaged individuals who have been convicted of a felony or released from a prison in the 12 months prior to hire)." --that doesn't look like a subsidy or a tax incentive for prison labor, but let's take a closer look. The WOTC was enacted a part of the "Vow to Hire Heroes Act", P.L. 112-56, signed into law in November 2011. Never heard of it? That's because there was virtually no press coverage of it and anyway who would vote against a law that vowed to hire heroes? Oh, it turns out quite a few people would vote against it when you find out that the vow to hire heroes involves in fact a vow "[t]o amend the Internal Revenue Code ... to repeal the imposition of 3 percent withholding on certain payments made to vendors by government entities." 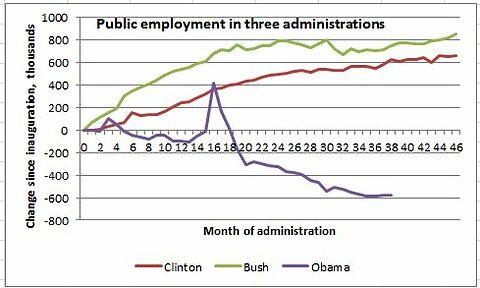 This title may be cited as the `3% Withholding Repeal and Job Creation Act'. SEC. 102. REPEAL OF IMPOSITION OF 3 PERCENT WITHHOLDING ON CERTAIN PAYMENTS MADE TO VENDORS BY GOVERNMENT ENTITIES. (a) In General- Section 3402 of the Internal Revenue Code of 1986 is amended by striking subsection (t). (b) Effective Date- The amendment made by this section shall apply to payments made after December 31, 2011. What, you don't know what the repealed s. 3402(t) said? Me neither. So let's look at that. It seems 3402(t) imposed a 3% withholding tax on all payments made under government services contracts. Is this really the subsidy for hiring prison labor that bothers the authors of the article? The work opportunity tax credit itself doesn't seem to help vendors--it might help the workers (though I don't even think they are a "targeted group") but not the employers. The rest of the vow to hire heroes act is about using VA funds for retraining. But if this repeal of the 3% tax is the problem, it doesn't seem to warrant the subsidy label. This is because as we know, a withholding tax is not a surtax but simply a mechanism for withholding taxes, and you get credit for the withholding when you fill out your income taxes, so it seems like 3402(t) is just an administrative provision, what is the big deal? In other words, where is the subsidy if you repeal the withholding? But there is another complication here: it seems 3402(t) withheld amounts were creditable only against "income" taxes, and not "employment" taxes, i.e., not the employer-portion of social security/FICA/FUTA type taxes. This means, it seems, that under 3402(t), the government would withhold 3% from payments made under government contracts, and the vendors in those contracts would be paying, in effect, a flat 3% excise tax that would not be deductible against the employer's share of social security taxes owed in respect of its employees, but only against the vendor's income taxes. If the vendor was a small business with low income itself, the 3% acts like a flat 3% income tax floor that disappears once the vendor's actual income tax is sufficient to soak up the withheld tax. Yes, an AMT for vendors with government contracts. But both the withholding tax and the repeal seem like really small potatoes--the AMT only kicks in if your income is tiny and then only imposes a tiny alternative tax. So first, why in the world would Congress write a tiny AMT for government vendors, and then why would they repeal it? The answer to the former may be revenue raising--3402 was enacted under the Tax Increase Prevention Act of 2005 (TIPRA), in which it was, of course, not a tax increase prevention but in fact a tax increase for some, but so obscure, who would notice? (there are other revenue raisers in TIPRA, such as in the context of the s. 911 foreign earned income tax exemption, so this is not shocking despite the contrary title). And the answer to the latter might be, enacting job creating legislation is trendy, and it's better if the legislation is viscerally appealing but doesn't cost too much. So now we get to how it is that an act vowing to hire heroes turns up looking like a "subsidy" for vendors using prison laborers: previously, all vendors had a tiny AMT imposed on their government contracts, and now they don't; some government vendors use prison labor; ergo vendors using prison labor just got a tiny tax cut in the form of tiny AMT repeal. As a subsidy it looks pretty obscure. Perhaps I am missing something fundamentally obvious to someone in the industry, or in the business of tax accounting for government contracts. But looking at the Congressional record on the subject, it seems like a dog and pony show. The effect of the repeal of the withholding requirement would be to avoid a decrease in cash flow to these contractors, which would allow them to retain these funds and use them to create jobs and pay suppliers. This would complement the Administration's other efforts to help small businesses. Mr. Speaker, H.R. 674 is an extremely crucial piece of legislation that will permanently repeal the 3 percent withholding requirement on all government contracts. ... H.R. 674 will remove any uncertainty from contractors that this tax would eventually be placed upon them. During these difficult economic times, this extra tax would limit access to capital, increase operating expenses, and take money out of local economies fortunate enough to have contracts to build infrastructure. That means, not only would businesses be burdened, but whole communities as well, because these local contractors would not be able to hire more local workers. As a result, infrastructure projects would slow, further burdening businesses, communities, and citizens that rely on infrastructure for transportation to work, running water for their families, and interstates to move goods and services. That's a lot of faith in the incentivizing effects of a tiny tax cut that probably isn't even a tax cut at all for the majority of vendors. Crucial? It's hardly even noticeable. Coming back up from the rabbit hole, maybe these are subsidies and tax incentives for hiring prison labor, and if so, we can see why they might be provocative when labelled as such. But equally, we can catch a glimpse of just how fragile our hopes might be for the tax-cut-fueled job creation effort, and we can confirm what Steve Dean has shown: that a lot of the complexity of the code is really deliberately manufactured out of politics. Attractive complexity: it attracts politicians and it attracts controversy. Labels: economics, institutions, rhetoric, Tax law, tax policy, u.s.
FT has an article today that is worth reading for how it considers the local social and cultural impact of the income gap at the extreme: mega mansions arising in neighborhoods that end up empty much of the time as their owners jaunt from property to property throughout the year, and the attendant service industry that grows to meet the expectations of the sojourner class. “Even very good architects manage to generate a style that is not usually much admired by engaged residents and passers-by, whether the poor aficionado urban historian, old wealth, or anti-gentrification activists." I had to read that twice. But I think what Sassen is saying is that the housing and amenities that appeal to the 1% are to society and culture what the house & home/how to spend it are to news consumption for me: commanding of attention, and even driving the whole design, yet completely irrelevant and even bothersome when put into the context of a social fabric that is mostly not about them. "Real News Network segment gives a window into the efforts to squash criticism of the neoliberal orthodoxy in the world of international agencies. Even though the UN Conference on Trade and Development (UNCTAD) gets very little attention in the major media, its well researched and often prescient reports are enough of a threat to the orthodoxy to produce efforts by the advanced economy block in the UN to try to clip the wings of the agency. The start of this interview may seem like a bit of inside baseball, but it shortly gets to issues that are critically important." Prashad talks about the multiple reports issued by UNCTAD that accurately predicted the financial crisis and "warning the world about what has basically taken place, which is that our social lives have become financialized," while the IMF continued to champion financialization and "in the midst of crisis was recommending the exact same recipes that it had recommended when there was no immediate crisis." Then he talks about the institutional structure of negotiation in the UN, and talks about the attempt by Switzerland to railroad the discussion, redlining anything about financial controls and regulations. "if you were relatively objective you would see that the IMF reports don't seem to learn from each other. There's a lot of religion in the IMF reports. The UNCTAD reports, on the other hand, are very strongly empirically based, there's a lot of evidence in the reports, and they have warned about specific, concrete problems in the financial sector. This is not just a kind of religious document. These are very precise documents that warn about specific things. So the North has been saying that UNCTAD writings about finance exceed the mandate of UNCTAd, and it needs to return to its mandate, so what does that mean?" He says it means deal only with the effects of the financial crisis on the developing world--don't look at the root causes of the crisis, which would entail looking at the institutions and regulations of the global north. Prashad asks who is looking at the causes, and the answer is, no one is, and those in the global north would prefer to keep it that way. I'm taking away your candy. Now vote for me. ...Mr Romney has pledged not to raise the preferential rate on capital gains and dividends; 75% of those benefits go to the top 1% of households. That group also prospers most from Mr Romney’s proposed cut in the top income-tax rate, to 28% from 35%. So Mr Romney would probably have to target the rest of the upper quintile, the upper-middle class who gain from other big tax breaks for employer-provided health care, mortgage interest, retirement savings, state and local taxes and municipal bond interest. Democratic governments have exhibited tendencies to run perennial budgetary deficits. Candy: it has to be paid for, now or later. We should note at the outset that elements of our argument are over 280 years old, appearing in the final chapter (Book V, Chapter III) of Adam Smith's Wealthof Nations. Smith identified incentives on the part of governments and citizens to prefer deficits and debt funding to current taxes in financing expenditures; see Smith [23, 878, et passim]. He also identified incentives which favor certain types of funding in cross-national comparisons (see note 9 of the present paper). Needless to say, Smith issued grave forebodings about great accumulations of debt which always ended, he claimed, in debasement of the monetary unit and bankruptcy. Protracted wars were also made possible by government's ability to incur debt. So Americans will likely keep their candy, and their line of credit, no matter who takes the election in the fall. Labels: budget, economics, institutions, lobbying, tax policy, u.s. If the book is just too much, you can read some of his papers on the subject, here and here for example. This is an interesting perspective for those of us who think about the nature of sovereignty in the context of tax. As I've mentioned here before, I struggle with what sovereignty means for taxation because I think it is one of those concepts that can be used to mean vastly different things depending on the desired goals. Tax sovereignty, for example, has been used as a shield against multilateral treaties (because multilateralism might erode tax sovereignty), and at the same time a sword against certain nations (because they are exercising their sovereignty in an "unfair" way). Thinking about the state as a fiduciary in this context, will we come to a different way to think about the exercise of the power to tax? On the to-read list. S. 1258 - A bill to provide for comprehensive immigration reform, and for other purposes. A couple of recent Krugman columns dealing with austerity are of interest. The mixed messages in his comments illustrate the difficulty in reading that chart, and one of his readers helpfully points us to this xkcd depiction. 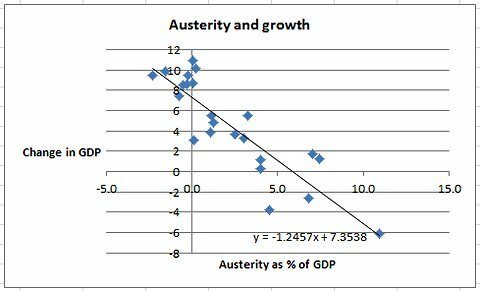 But I think he is showing that greater austerity leads to lower GDP growth, so that more austerity translates to a longer/worse recession. The average tax and social security burden on employment incomes increased in 26 out of 34 OECD countries in 2011 according to the new OECD Taxing Wages publication. Tax payers in Ireland, Luxembourg, Portugal and the Slovak Republic were among those hit with the largest increases. Those in New Zealand and the United States saw their tax burden fall. In Hungary, the average single worker without children was faced with the largest increase in the tax wedge, but for families with children, it fell. This paper summarizes the findings of a two-year research project on "informal international lawmaking" (IN-LAW), that is, cross-border normative activity involving non-traditional actors, processes and outputs. We evaluate the likely reasons for the rise of IN-LAW and weigh possible options in response. We then assesses the legitimacy of both new forms of cooperation and traditional international law, also tackling the questions of whether new forms benefit powerful actors and how to keep activity accountable. Finally, focusing on the short to medium term, we question whether some of the new outputs of international cooperation could already be seen as part of traditional international law and how traditional and new forms are (or could be) interacting before international courts and tribunals. In this respect, we propose certain procedural meta-norms against which new cooperation forms ought to be checked, which we refer to as 'thick stakeholder consensus' imposing limits in respect of actors (authority), process, and output. Intriguingly, this benchmark may be normatively superior (rather than inferior) to the validation requirements of traditional international law, coined here as 'thin State consent'. We live in a world of legal pluralism, where a single act or actor is potentially regulated by multiple legal or quasi-legal regimes imposed by state, substate, transnational, supranational, and nonstate communities. Navigating these spheres of complex overlapping legal authority is confusing, and we cannot expect territorial borders to solve all these problems because human activity and legal norms inevitably flow across such borders. At the same time, those hoping to create one universal set of legal rules are also likely to be disappointed by the sheer variety of human communities and interests. Instead, we need an alternative jurisprudence, one that seeks to create or preserve spaces for productive interaction among multiple, overlapping legal systems by developing procedural mechanisms, institutions, and practices that aim to manage, without eliminating, the legal pluralism we see around us. Such mechanisms, institutions, and practices can help mediate conflicts, and we may find that the added norms, viewpoints, and participants produce better decision making, better adherence to those decisions by participants and non-participants alike, and ultimately better real-world outcomes. Global Legal Pluralism provides a broad synthesis across a variety of legal doctrines and academic disciplines and offers a novel conceptualization of law and globalization. Ayres and Braithwaite's Responsive Regulation (RR) has opened up important new ways of thinking about regulation in the 20 years since its publication. But RR was envisioned as a tool for domestic agencies. Thus, although RR focused on encouraging business self-regulation, it was designed for a setting in which agencies had clear jurisdiction, full regulatory capacity and extensive information, and could (contingently) deploy stringent sanctions against well-defined private targets. Since 1992, however, the locus of many regulatory problems has shifted to the transnational arena, characterized by multiple regulators, public and private, with limited capacities, authority and information and modest sanctioning ability. As production has globalized, moreover, targets have become diffuse and difficult to identify. RR holds important lessons for transnational regulation, but it must be adapted to these challenging conditions. Some components of transnational RR are already emerging. These include many private and public-private schemes that regulate (and self-regulate) business through voluntary norms: "transnational regulatory standard-setting" (TRSS). Acting alone, however, TRSS schemes face serious limitations. International organizations (IGOs) are the best-positioned transnational responsive regulators, but lack agency-like authority. To adapt RR to the transnational context, IGOs should focus on strengthening and working with the nascent TRSS system. Two techniques are particularly promising. In "regulatory collaboration," IGOs engage with business to promote self-regulation, much as in RR. IGOs have limited ability to escalate in response to defection, but can deploy reputational and market sanctions (negative and positive). In "orchestration," IGOs catalyze, support and steer intermediaries, including TRSS schemes and NGOs (PIGs), which use their own material and ideational capacities to regulate and promote self-regulation. Orchestration cumulates regulatory competencies and creates avenues of escalation. It also provides many benefits of RR "tripartism:" deterring capture, promoting contestability and experimentation, empowering societal groups and disciplining "zealous PIGs." Orchestration can also be applied internationally in regulating states, and domestically in regulating business. I read with interest your story on the U.S. business lobby's efforts to push India into a tax policy war with the U.S. in the April 19 edition. You report that a coalition of lobbyists "sent a letter to Mr Geithner asking him to 'raise concerns' about the tax bill in talks with Indian officials during the spring meetings of the World Bank and International Monetary Fund this week." These folks do not want to "raise concerns." They want to stop India's democratically elected government from enacting legislation in accordance with its sovereign status as an independent nation, and it is amazing and preposterous that they fully expect the U.S. government to help them do that. This is because of course if U.S. businesses really don't like what India is doing, they have a perfectly viable option, which is to do what they say they are going to do, namely, take their assets and go home. But they do not want to do that. They want to be able to continue doing business in India at the lowest possible cost to them, and if the Indian government won't play along and give them the tax system they want, these business leaders would like to turn this into a government-to-government conflict so that it is India against the U.S. instead of India minding its own business, writing its own laws, and opening itself to businesses willing to work within its sovereign territory according to its own rules. Anyone is free to disagree with India's tax policy direction, and anyone is free to express "concerns" about it. But India's tax policy decisions belong to India's people, and it is shameful to see the U.S. business lobby so brazenly insisting on their right to intervene. I see that it's prompted a response; this is an important topic so I am happy to see it getting some attention even if I disagree with the writer. "The repatriation campaign ran into resistance in part because the money held outside the U.S. was seen in Congress as a way to help finance an overhaul of the tax code, the lobbyist said." I will accept that as a political/pragmatic reason why repatriation amnesty might have been killed in this instance but I still hold out hope that (1) the principle of the thing and (2) the fact of its empirically observable outright failure as a stimulus policy, might have had some sort of impact, so that it's not just a political change that keeps the U.S. from re-adopting this patently outrageous program (first seen in the 2004 JOBS Act). WIN America's anti-tax twitter screed feed was last updated a month ago March, ending with this gem: "Apple CFO: 35% tax rate is an "economic disincentive." We need to take down barriers, not keep them up." Pithy. But so self-serving as to be embarrassing. It's pretty clear Apple's actual tax rate undoubtedly gets no where close to that figure and the company seem to be fully able to pay its taxes as a matter of cash flow. Labels: lobbying, MNCs, tax policy, u.s.
Want to give the IRS a piece of your mind? Now you can, by applying to be on the IRS Advisory Council. "The Internal Revenue Service is accepting applications for membership in the Internal Revenue Service Advisory Council (IRSAC) for a three-year term beginning January 2012." Demonstrable ability to examine situations from a "macro" perspective. I am pretty sure by that last bullet point they mean "big picture" and not by applying econometrics, but I could be wrong. The IRSAC is about you telling the iRS how you feel about it as an administration, not about you telling the IRS how you feel about the tax laws (that's what lobbyists are for). "The Internal Revenue Service Advisory Council (IRSAC) conveys the public's perception of IRS' activities and, plays a significant role as external evaluator regarding the reorganization and its implementation." "Members are not paid for their services. However, travel expenses for working sessions, public meetings and orientation sessions, such as airfare, per diem, and transportation to and from airports, train stations, etc., are reimbursed within prescribed federal travel limitations. As an aside, I can't imagine what possessed the IRS to call this "open season" for membership. Labels: institutions, IRS, tax policy, u.s. If you are going to engage in dodgy transactions, don't do so through "Let’s Hope It Works, Inc," "CrapCo" or "Should Not Participate, Inc," says Above the Law's Mark Hermann. Yes, it's a bit of a slap in the face isn't, when things go south as the founders knew it would and they were laughing at their investors all along. Moreover, don't use Star Wars characters either, no matter how strong with the force you feel. I'd like to say don't use "Offshore Holdings" either, but that's like saying don't use "Inc". Tax Analysts has asked me to become a regular contributor to TNI with a column; my first installment is on the insertion of "arbitration" in the new UN Model treaty. If you subscribe, you can find it here; here is a pdf. I look at the new arbitration provision in the UN Model treaty, complain that this isn't really arbitration at all, and argue that countries should be very wary about signing on to this provision. Several features of policy making are worrying, particularly in Europe. The first is a democratic failure. An economic policy has to be ultimately something that people understand, appreciate and support. That’s what democracy is all about. The old idea of “no taxation without representation” is not there in Europe at the moment. ...If you are living in a southern country, in Greece, and Portugal and Spain, the electorates views are much less important than the views of the bankers, the rating agencies and the financial institutions. One result of European monetary integration, without a political integration, is that the population of many of these countries has no voice. Economics is de-linked from the political base. That I think is a mistake and it goes completely against the big European movement that began in the 40s and fostered the idea of a democratic, united Europe. . .
Our article develops a new framework for understanding the drafting and interpretation of the agreements of the WTO, based on comparative institutional analysis. Our aim is to provide a better means for describing and assessing the consequences of choices in treaty drafting and interpretation. Both treaty drafting and judicial interpretation implicate a range of interacting social decision-making processes, including domestic, regional, and international political, administrative, judicial, and market processes — which we collectively refer to as institutions. Our framework focuses attention on the way that choices among alternative institutions implicate different social decision-making processes, thereby affecting participation and welfare. We draw on specific examples from WTO case law to illustrate our framework. While our article focuses on the WTO, the framework that we develop has general relevance for understanding the interpretation of international and domestic legal texts from "law and economics" and "law and society" perspectives. It builds on work by Grief, Komesar, North and Williamson. We develop further the comparative institutional analysis suggested by these and other authors. Since we are thinking a lot about dispute resolution in international tax law, the way things are done at the WTO matters. The work of interpreting treaties is done in the tax world by competent authorities and is completely confidential--there is no publicity and therefore no possible intellectual analysis of the interpretive and institutional choices being made. Trachtman and Shaffer's work illustrates what a loss this confidentiality presents for us in the tax world--we can see that in trade circles analysis can be undertaken and problems in the system can be identified and subject to public discourse--there is plausibly room for law to develop in such a system. Why do people engage in fraud? "Traditionally, when we think about bad behavior, we think about character. But psychologists who study bad behavior — who study, say, fraud in the business world — have found that that character doesn't explain everything. They've found that a lot of unethical behavior can be explained by cognitive errors — errors that affect almost everyone. On today's show, we talk to a man who started out as an upstanding businessman, and went on to commit bank fraud involving millions of dollars. It drove several companies out of business and resulted in the loss of around a hundred jobs. We try to figure out why he did it, and what it means for the rest of us." ...At present there are no clear rules stopping members of the House of Lords acting as paid lobbyists for companies or other governments despite widespread criticisms from transparency campaigners. "On the register of Lords interests Lord Blencathra, formerly David Maclean, declares that he is director of the Cayman Islands Government Office in the United Kingdom. But as he admitted during a recent visit to the island, the role is effectively one of a lobbyist and he was hired not for his knowledge of the British Overseas Territory but for his political understanding and connections. The Premier of the Cayman islands Mckeeva Bush said at the time of the peer’s appointment: ‘It is vitally important that Cayman has a strong voice in Westminster and Brussels and I am delighted that a politician with David’s experience will ensure that our interests are protected at a time when tax neutral jurisdictions such as our own are the subject of such malicious and ill informed attacks.’ "
So the Lord feels like a Parliamentarian and his job is to "feed that advice" and the client paying him to do that does so because they want a "strong voice in Westminster and Brussels." Sorry, where's the British Parliament again? The Lord also takes it upon himself to serve as PR police. Let's see, controlling the message, feeding the advice, and seeing himself as still a Parliamentarian. If you haven't yet read Nicholas Shaxon's book Treasure Islands, it's high time. Is the US backing away from being a tax haven? Big news from earlier this week: TJN reports that the US will finally extend its interest reporting regulations beyond Canada. More on this to come. Labels: disclosure, tax policy, u.s. The agreement between HMRC and Goldman Sachs reached in 2010 could be quashed after the high court allowed a preliminary permission hearing to take place on 13 June following court filings made by the activist group UK Uncut Legal Action. "It’s alleged that David Hartnett, the government’s top tax man, who loves to be wined and dined, met Goldman Sachs’ top brass in late 2010 and with a handshake agreed that the bank would be let off paying £10 million owed to the public purse in interest on an unpaid tax bill. To challenge this back room deal, UK Uncut Legal Action, with the help of law firm Leigh Day & Co, is threatening legal action against the HMRC unless this dodgy and unfair decision is quashed." Then at a tab called "quids in" it says further that "We are taking HMRC to court because we believe that their secret deal was unlawful. HMRC and Goldman Sachs can afford the best lawyers in town, so we need your help to take them on. It’s the people’s court case." If anyone understands the legal structure under which they can sue, can you fill me in? Why so much welfare for this industry? "As secretary of energy Steven Chu confirmed at a recent Senate hearing, without federal liability insurance and loan guarantees, no one would ever build a new nuclear plant." But why not? As Sanders & Alexander point out, "The Exelon, which takes in $33bn in revenue annually, is the leading operator/owner of nuclear reactors in the US. Entergy, with revenues of more than $11bn annually, is the second largest. Together, these two companies own or operate almost one-third of US reactors, and based on their revenue they are doing pretty well." Why so much welfare in the face of so much prosperity, they want to know...could it be because of these guys or how about these guys? Entergy spends $4.6 million a year on lobbying and has thirty eight lobbyists. Wow! And the latest isn't even listed yet, make that 39. Exelon has 36, and spends at least $6 million a year lobbying (I don't know how much either pays for things like "historical consultation"). And they've got help: overall, 1,494 clients hire lobbyists to work on nuclear & energy policy. Sanders and Alexander argue, "[a]fter 60 years, this industry should not require continued and massive corporate welfare. It is time for the nuclear power industry to stand on its own two feet." Who knows what the industry "requires" in terms of subsidies. It doesn't matter. The only thing that determines how much welfare they get is is how much they can spend on lobbying. Labels: budget, corporate tax, lobbying, tax policy, u.s.
Tim Geithner did what the US lobbyists wanted, informing Pranab Mukherjee, India's finance minister, that the Americans "have concerns" feel they have the right to say what India's tax laws can and can't do. "Geithner noted that "certain tax provisions in ... (Budget 2012) have raised significant concern among US industry and dampened enthusiasm about India's investment climate". From the mouths of BNY, UBS, Goldman, AIG, Apple, etc, straight to the lips of the U.S. Treasury Secretary. "In fact, the proposal to tax indirect transfers of Indian companies is without regard to international tax norms and is not in line with the OECD or UN model double-taxation treaty." But hold on a moment. International tax norms? What are those? Let us remember that the OECD does not include India in its membership, and neither does it include Brazil, Russia, China, or South Africa. Can you really have an international tax norm if you don't even bother to consult the BRICS? Moreover, Vodafone had to admit that China has in fact been taxing similar transactions since 2008, in cases that lack business purpose. I think that might be India's point. But the larger point is still, so what? If India determines to create a tax system that differs in some respects or in all respects than the US, the UK, or even every other member of the OECD, under what theory of entitlement does Vodafone or indeed any other company, in India or otherwise, have a say in that decision? But despite all the criticism, pressure and entreaties, the government has shown no signs of relenting and appears determined to recover taxes from the UK telecom company. Vodafone says the [BIT] covers "indirect investments" and shelters the Hutch-Essar transaction. "Vodafone believes that if the retrospective tax proposals were enacted it would amount to a denial of justice and a breach of the Indian government's obligations under the BIT with the Netherlands to accord fair and equitable treatment to investors." India: Tim Geithner won't tell you I said this, but I think you ought to keep up the fight. Labels: India, lobbying, sovereignty, tax policy, u.s. In Borders among Activists, Sarah S. Stroup challenges the notion that political activism has gone beyond borders and created a global or transnational civil society. Instead, at the most globally active, purportedly cosmopolitan groups in the world—international nongovernmental organizations (INGOs)—organizational practices are deeply tied to national environments, creating great diversity in the way these groups organize themselves, engage in advocacy, and deliver services. Stroup offers detailed profiles of these "varieties of activism" in the United States, Britain, and France. These three countries are the most popular bases for INGOs, but each provides a very different environment for charitable organizations due to differences in legal regulations, political opportunities, resources, and patterns of social networks. Stroup's comparisons of leading American, British, and French INGOs—Care, Oxfam, Médecins sans Frontières, Human Rights Watch, Amnesty International, and FIDH—reveal strong national patterns in INGO practices, including advocacy, fund-raising, and professionalization. These differences are quite pronounced among INGOs in the humanitarian relief sector, and are observable, though less marked, among human rights INGOs. Stroup finds that national origin helps account for variation in the "transnational advocacy networks" that have received so much attention in international relations. For practitioners, national origin offers an alternative explanation for the frequently lamented failures of INGOs in the field: INGOs are not inherently dysfunctional, but instead remain disconnected because of their strong roots in very different national environments. "It is amazing to witness the number and scope of organizations today that claim to be “without borders.” Doctors, reporters, architects, lawyers, librarians, mothers, chemists, clowns, acupuncturists, and even bees now have organizations that claim be with “without borders” or “sans frontières.” This enthusiasm for expressing global sympathies and taking global action has also taken hold in the academic community. The vast and growing literature on international non-governmental organizations (INGOs) reveals that these organizations can change state policy and shape social practice in many places around the globe." Fascinating body of work she's developing. You can choose your tax reform options and see how it impacts the curves. Compare, for example, eliminating the EITC with doing the Reagan thing to capital gains. Since the Laffer curve doesn't kick in until at minimum about 70% or so, I figure you could raise almost $400 billion with just a few tweaks. Labels: fairness, infographic, tax policy, u.s.
You pay $426 more in tax because of tax dodging. That's according to the the US Public Interest Research Group in a recently released report entitled Picking up the Tab. They base it on an estimate of a $100 billion tax gap, which is likely a conservative guess since it is based on what is known, and tax evasion is based on making sure things aren't known. "Even when tax haven abusers act perfectly legally, they force other Americans to shoulder the burden in a variety of ways. The taxes they don't pay must be balanced by other Americans paying higher taxes, coping with cuts to public spending priorities, or increasing the federal debt. If ordinary tax filers were to pick up the full $100 billion tab in the form of higher taxes, they would need to pay an additional $426 on average. ... "
They break out business taxes differently, and estimate that smal businesses, which generally cant't shelter as effectively as big businesses, "would need to pay an average of $2,116 each in additional taxes" to make up for the dollars lost to offshore. The author concludes: "The argument that giving the moneyed elite more money will make everyone wealthier manages to ignore the roaring evidence of the past." The numbers are in millions of employees. This seems to indicate that there was an upward trend of foreign hiring up until some time between 2004 and 2007, and then a holding steady of both foreign and US employment within US MNCs since then. BEA's chart 1 seems to express this as a steady decline in US employment, which it certainly is as a percentage of total employment, but it looks like surging foreign employment is responsible for the decline. 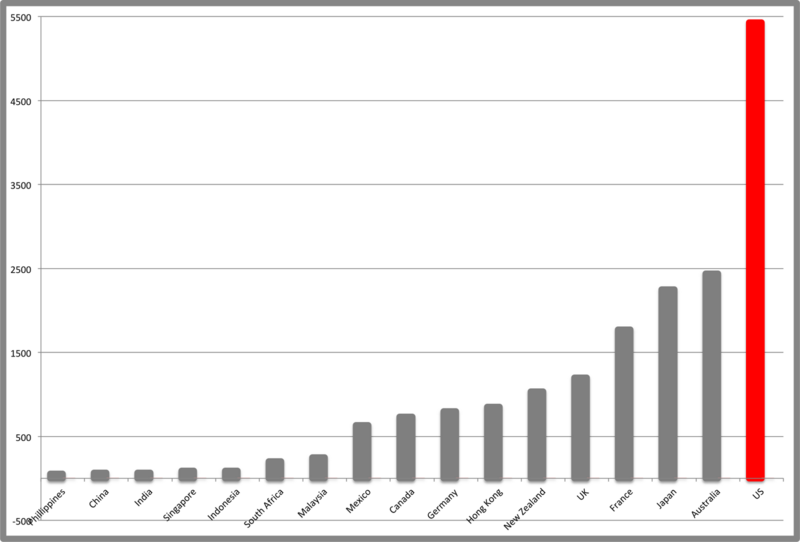 Also this doesn't necessarily means that grey bars represent only American citizens and orange represent only foreign citizens, since companies may move people around and it may be that many of the grey people are foreign and the orange people American, but in any event it's likely that the majority are citizens of the country in which they are employed. 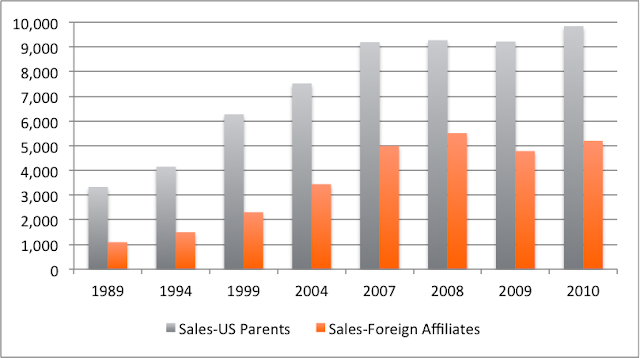 Even so we can see that foreign companies hire what looks like about half as many people in the US as US MNCs do abroad, and the employment in the US seems to be holding steady after a slight uptick between 1999 and 2002. That looks pretty startling doesn't it. But it just means that overall, for US MNCS, foreign sales are growing faster than US sales. 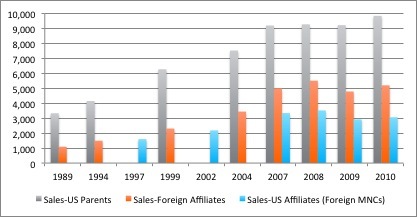 That's one reason to be an MNC--expansion to other markets. 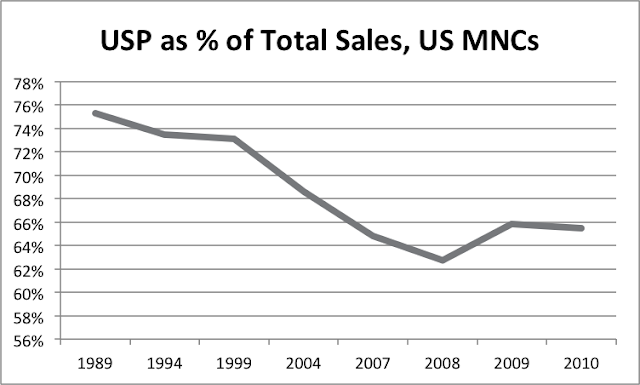 A bit of an upward trend until 2009, no surprise there, with an uptick in 2010 but more modest than that of the US MNCs. Global Witness calls for a thorough investigation into HSBC, Citibank and Abbey National (now owned by Santander) for their roles in the laundering of millions of pounds by James Ibori, former governor of Nigeria's oil-rich Delta State. Ibori pleaded guilty to ten counts of money laundering and fraud in relation to an estimated $250 million of stolen state assets on 27 February; today was the first day of his sentencing hearing. ... Ibori, who was governor of Delta State from 1999 to 2007, inflated government contracts, accepted kickbacks and even directly stole funds from state coffers. ...According to the prosecutor, Sasha Wass QC, Ibori and his associates used multiple accounts at Barclays, HSBC, Citibank and Abbey National to launder funds. Millions of pounds passed through these accounts in total, some of which were used to purchase expensive London property." "In America Ibori held two accounts at Citibank and ran up a $920,000 American Express credit bill between 2003 and 2006. He bought a $1.8 million house in Houston, as well as moving at least $500,000 through his lawyer's client account at the now-defunct AIDT bank in Denver, Colorado." Global Witness is involved because they are a prime mover in the tax transparency movement, and they point to the Ibori situation as a reason why governments need to advise their securities laws to force companies to disclose their beneficial ownership, among other items. "Understanding actual capitalism needs an understanding of the domain of the offshore economy, especially of tax havens and regulation-free zones. They are based at offshore jurisdictions which provide mandatory secrecy. An extensive part of the global economy is therefore able to operate in the shadows. Consequences of the offshore economy for non-financial companies and different citizens of offshore jurisdictions. The aim of this conference is to bring together researchers from different fields (such as economists, sociologists, historians and political scientists) to explore neglected aspects of the global offshore economy. Abstracts are due September 1st, and the conference will be held in English and German. More info at the link. I sent this NPR story to my tax students to both demonstrate that what they are learning has real world relevance and to remind them that they know why Young Buck can't deduct the cost of his watches. Even though they are quite the watches (many NSFW). 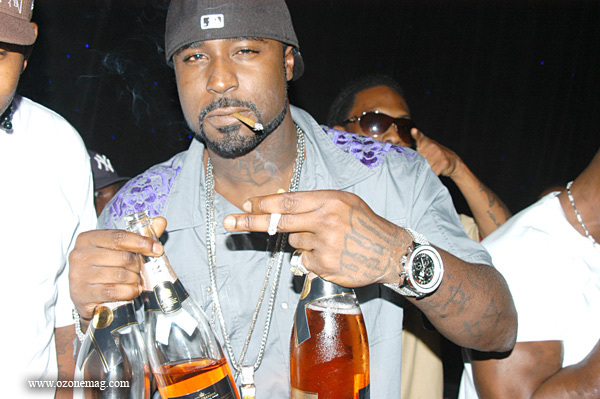 "When IRS agents raided the house of rapper Young Buck, they seized all his things: his white leather dining chairs, his watches, his craps table, his tattoo kit. Even his refrigerator. The Nashville artist, who was once part of 50 Cent's G-Unit, owed hundreds of thousands of dollars in back taxes. ... if you're an entertainer, what qualifies as a business expense can seem really murky. Your whole lifestyle is not tax deductible. Madison has tried to deduct watches, arguing that it's a necessary business expense for his client to have a certain look. The CPAs at his company threw it back." Is India not entitled to tax sovereignty? Taxing Amazon, an amazingly taxing task. Academic Fields of Study, by "Realness"
Freedom of Religion? from Mandates? Want to move to IKEAland? What is FATCA not as bad as?